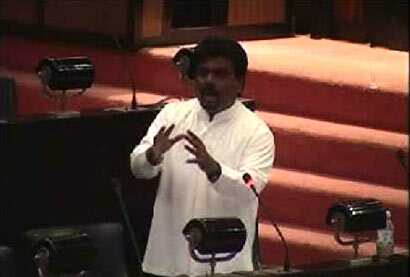 JVP Parliamentary Group leader Anura Kumara Dissanayake, yesterday in Parliament, demanded to know from the government what action had been taken with regard to a person who had sent a request to the Customs, from the Prime Minister’s office, to release a container load of heroin imported to the country from Karachi. The stock of heroin worth around Rs. 2,600 million was considered the biggest detection of narcotics in the South Asian region, the MP said. He said the Sri Lanka Customs and police had seized 260 kilos of heroin imported as ceramic ware and grease, at the Orugodwatte Container Terminal on August 30. The container carrying the contraband had been imported from Karachi in Pakistan and was addressed to an institution called Rohan Impex at T 30, Railway Quarters, Maligawatte. However, subsequent investigations revealed that this organisation had applied for the registration at the Department of Registrar of Companies only after the container had reached the country on June 22, 2013. That indicated the fact that the smugglers had been in the background until the contraband reached Sri Lanka and after making sure of their ability to get it released had claimed the ownership of the container. Even though a Sri Lankan and a Pakistani national had been taken into the custody, along with the haul of heroin, the investigators had not been able to trace the mastermind behind the operation. The media has reported that investigations are in progress at local and international level. MP Dissanayake said: “The businessmen who imported this stock of heroin, are not small time smugglers as one could guess from the monies spent on the massive haul. As in the case of many fraudulent businesses, they, too, seem to have had the blessings of politicians. A letter was received from the Prime Minister’s office, seeking a duty waiver for the consignment, as reported by media. The letter has been signed by a coordinating secretary to the Prime Minister requesting appropriate action be taken to grant a waiver of demurrage and Ports Authority charges for the container. The letter said it was the first container imported by the company which was just launching its business and could not afford to pay heavy duties. This is a situation detrimental to the country in international forums as the name of Prime Minister or the second citizen of the country had been involved in an incident of this nature,” MP Dissanayake said. Dissanayake demanded to know the details of the consignment taken into the custody; whether a person had forwarded any letter to obtain a duty waiver; who had instructed the said person to issue such a letter; what action had been taken against the person who issued that letter; whether any assistance had been sought from the Interpol and the progress made in the investigation process. Prime Minister D. M. Jayaratne said that investigations were in progress and a complete answer to the questions raised by the MP would be given once the reports of those investigations were received.